In my last article, I wrote about the faithful participation in the life of Christ and what that entails on a practical level. In this present paper, I hope with God’s help to address the issue in terms of our beloved clergy. In the last paper, I made a distinction between being at church and being in church. On the surface, this distinction does not hold for our clergy by the fact of their ordination. We must necessarily be in church leading the services. However, the words of our Lord Jesus Christ come to mind, “This people draweth nigh unto me with their mouth, and honoreth me with their lips; but their heart is far from me.” (Matthew 15:8) There is a temptation for clergy and faithful alike to be physically present for services while their hearts remain cold and hardened. 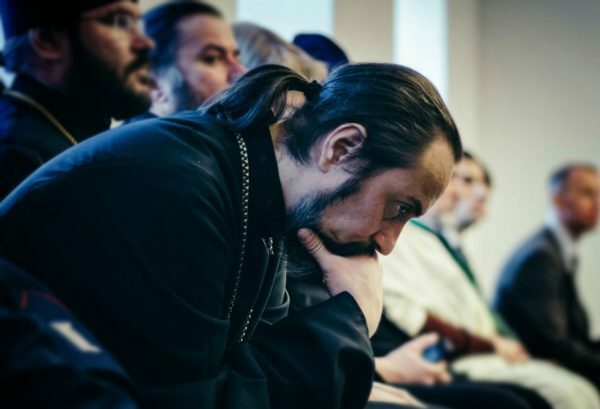 In the last few decades, the topic of clergy burnout has been much discussed and analyzed, even in the Orthodox Church. Prior to writing this article, I spent some time doing research on the subject and found some interesting if not troubling tendencies. When the topic of clergy burnout was broached, the authors (save a very few exceptions) employed examples of secular life from movies, television, and contemporary culture. In identifying the problems that typically led to burnout, at least according to these authors, the issues raised were often the same ones that one might find in a stressful secular job or in a corporate boardroom—power struggles, administrative issues, lack of recognition, or lack of pay or vacation time. In other words, the burnout was associated with a lack of satisfaction with the “job.” As one might expect, the solutions to this lack of satisfaction were rooted in modern psychology. In my years as a bishop and a priest, my experience has been quite different. I am not questioning the existence of the phenomenon of burnout per se—it exists and I have witnessed it, sadly. However, my experience of the problem has been quite different from what I described in the preceding paragraph. I have witnessed good and sincere clergy who are worn out and have expressed what others call “burnout.” They were serving at the Holy Altar but they remained preoccupied with the administration of the parish or the daily needs of their parishioners. They had come to view their “real work” as something other than the divine services. In most instances, such a perception was never verbalized. Most of them would not have even been aware of it. Please know that I am writing about good men who gradually found that their priorities had shifted and I am not judging them. The constant pull of the secular world had gradually eroded their original conviction that the only work that truly matters is the holy divine services. If personal prayer, continual repentance, and the liturgical life of the Church, are not the primary manner in which our lives are defined, we may easily adopt secular attitudes, thoughts, and behaviors. Father Petroniu Tanase, former abbot of the Skete of the Forerunner on Mount Athos, noted, “Everything we receive, we see, we hear leaves some marks…. Because you go on the road and see a filthiness [dirtiness]… and without your will, you do not think about it… but the dirt left a stain on you… Farther on, someone is quarreling, you hear some bad words, dirty, swear words…. You do not agree with them, but they remained in your soul…. To remove them, that means apatheia [absence of passions], to be without passion, that is the evil no longer impress you… to remove them is very difficult.” The removal of these stains is not accomplished through administrative work but only through the ascetical practices found in the services of the Church. The Church provides us with examples of a well-ordered life in the lives of the saints. For example St. Mary of Egypt struggled in the desert for forty-seven years, seventeen of which she endured tremendous temptation and suffering. When she recognized the passions welling up in her, she threw herself on the ground, asking for God’s mercy. Rather than imitating her example, we may be tempted to look for comfort by watching too much television or spend time surfing the internet instead of praying. We justify the behavior by telling ourselves we need to unwind and relax. This can happen to any of us whether we are clergy or laity, if our moorings are not firmly tied to the liturgical and spiritual life of the Church. Once we have become unmoored, we have a tendency to blame all types of external factors for our state in life. The sad fact is that we have all become soft. We desire an easy Christianity without a cross and without ascetic struggle. 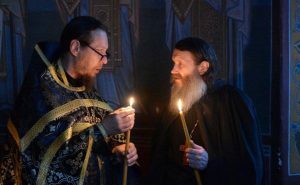 Saint Seraphim of Sarov was once asked: “How do our times differ from those of the first Christians?” Saint Seraphim replied that we do not share their resolve to follow Christ everywhere and at all times, to be with Him alone until the end. Providentially, there is always a way back to the Father’s house. We do not have to continue to seek that which is lacking from the husks that the swine eat (Luke 15:16). During Great Lent of 2017, His Grace Bishop Irenei (Steenberg) offered a deeply moving and spiritually insightful talk to the ROCOR hierarchs and clergy entitled, “The Cry of the Humbled Heart—the Ascetical Significance of the Great Canon.” I would highly recommend it for your edification, especially if you are struggling with the issues I’ve broached in this article. In his meditation, His Grace explains the circumstances concerning which the Great Canon was composed. “Something particularly relevant for our understanding of the Canon however, but without which we cannot understand the Canon, took place in the year 712. A ‘robber council’ was held, in which the decrees of the Sixth Ecumenical Council—where again, St. Andrew had been present in an official capacity—the decrees of the Council and the Council as a whole were rejected as the Devil attempted to strike a blow against the Church’s confession of truth in the face of the heresy of Monothelitism. “We have to remember that great tragedy of his life. Only a few years before—we don’t know the exact year of his death—but it’s possible he died as early as 726, which would mean he had fewer than fourteen years of life between his betrayal of God and the Faith and the Church at the robber council, and his subsequent repentance, and ultimately his repose. And it is in this context—of a man who had ascended from the sorry lot of a mute child to the highest offices of Imperial Orthodoxy; from the status of an unknown to the pastor of thousands of souls, who had nevertheless denied his Savior in the most vile of ways, yet had been rescued from his error by that same God and called back to His service—that St. Andrew pens the Great Canon. That is to say, his Canon of Repentance was not a theoretical work of a writer trying to explore themes that he felt were important for dogmatic or principled reasons. While burnout was not the cause that distanced St. Andrew from the Lord, his response provides us with clues as to the way out of this morass. The fundamental diagnosis is the same even though the presenting symptoms are different. The cure is also the same—heartfelt repentance. Such repentance can only be found in prayer. When our hearts become dry and hardened, the example of Saint Andrew provides a curative example of what our next step should be. Rather than plunging further into administrative duties or extra-spiritual work, we renew the commitment to the prayer rule. If we remain steadfast and committed to this, we will find prayer an infinite oasis of nourishment, rest, and comfort. The long services will become transforming and an opportunity for personal refreshment rather than an arduous obligation. Once again, His Grace gives us an example in how the Divine Scriptures become alive for us. A life lived in repentance is the only life worth living. We will find that the old, secular bromides such as “You deserve to be happy” or “You deserve to be recognized” will be understood for what they are, panaceas that destroy the spiritual life. Repentance is the antidote to all the passions and has the transformative power to make us true disciples of Christ. Repentance transforms our hearts and our minds, healing the nous, so that we see ourselves as God sees us—fellow workers in the Lord’s vineyard rather than competitors with our brother clergy; servants and fathers to the spiritual children the Lord Jesus has entrusted us. Perhaps, most significantly, we will find the peace, joy, and love which we seek. In this scenario, burnout is a non sequitur. [i] Stavros, George. Spirituality and Health: The Soul/Body Connection. Winter 1999.